Analyst Grades Siri a "D"
An industry analyst says that Apple's Siri gets a "D" in accuracy. A man uses 'Siri' on the new iPhone 4S after being one of the first customers in the Apple store in Covent Garden on October 14, 2011 in London, England. The widely anticipated new mobile phone from Apple has seen customers queue in cities around the world for hours to be amongst the first to buy the device. 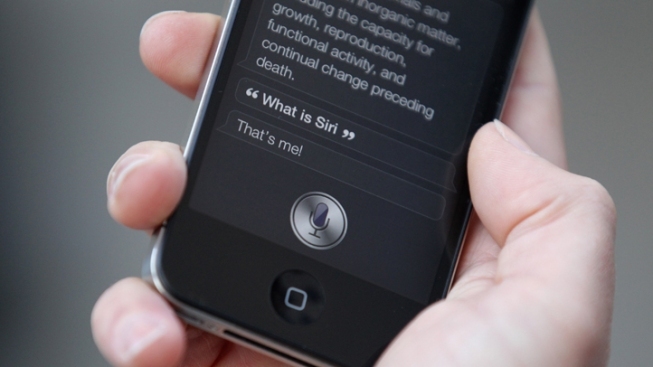 A new reports says that Siri's search accuracy tops out at 68 percent -- and it's only that high in quiet rooms. In 1,600 common searches, Siri successfully completed the request 62 percent of the time on a loud street and 68 percent in a quieter setting, according to a report by Piper Jaffray, a Minneapolis-based investment bank. Siri was graded a "D" for accuracy. Some users have even started a class-action suit against Apple for misleading advertising. While Apple rarely comments on negative press or its mistakes, it has said that Siri was still in beta when it was placed on the iPhone 4S. Despite the low marks, it's not all bad for Siri. Apparently she's good at comprehension and accurately repeating a question, but the problem is when she needs to turn "those words into a correct answer" such as finding directions, according to Bloomberg. In deciphering what someone is saying, she rates 83 percent on a busy street and 89 percent in an area with low noise. If Apple can get Siri's accuracy up into the 80th percentile, Google should be worried. But apparently the tech company already sniffed out that possibility and is already working on its own voice-recognition search.